Having naturally curly hair has its perks, but it can be a challenge finding the right products and routine to enhance your curls and eliminate frizz. I have had several readers request that I do a post on the products I use and how I fix my hair. I’ve found over the years of trial and error with my curls that some variation of these types of products works best for me. Hopefully this will help some of you curly haired ladies! Step 1 – To many people this may sound strange, but I do not wash my hair everyday. I usually wash it every other or every third day. I have found doing this has stopped my hair from being so dry, brittle, and frizzy. I know for many this isn’t always feasible if your hair is oily, but dry shampoos can help a lot. 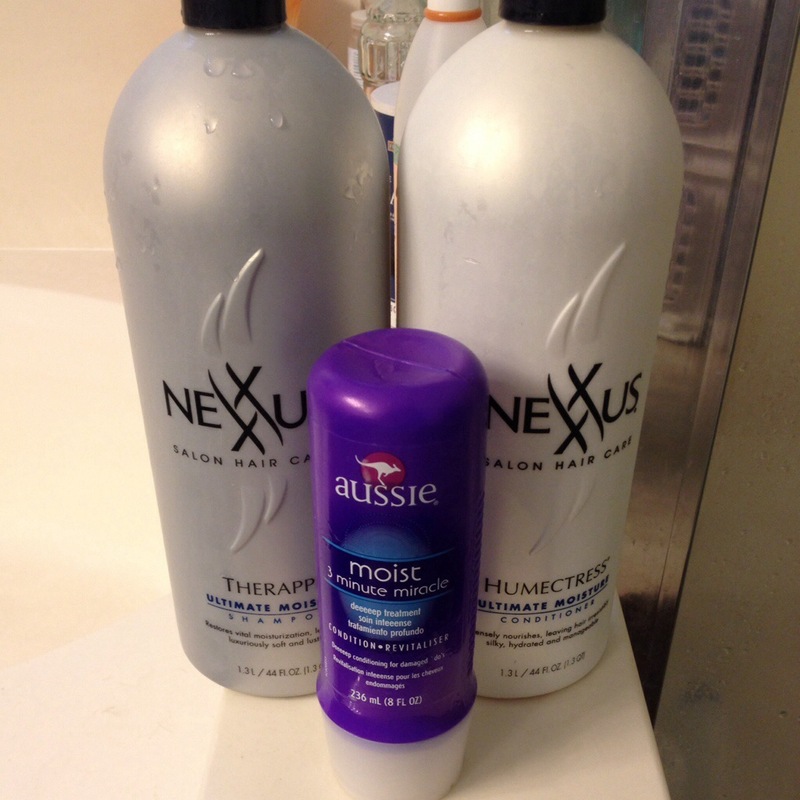 For shampoo I am currently using Nexxus Therappe Shampoo that I bought at Costco for $19.99. This is a great deal for a 1.3 L bottle! I use 4-5 pumps of shampoo each time I wash my hair. 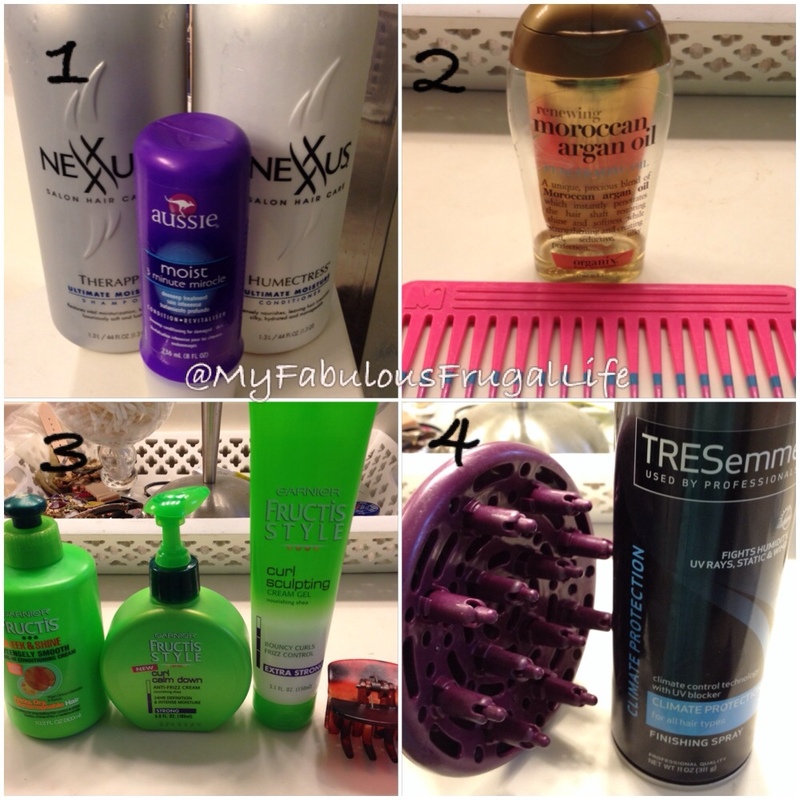 I work the shampoo into my scalp and massage/work it through the ends of my hair and rinse immediately. Shampooing probably takes me 1-1.5 minutes. I then deep condition every time I wash my hair with Aussie Moist 3 Minute Miracle deeeep treatment. There are always Aussie coupons in the Sunday paper. I use those and my Target Red Card to get this amazing deep conditioner for less than $2 a bottle. Work the conditioner into your hair from the ends to your scalp. I try not to get conditioner on my scalp. I do not rinse out the conditioner and then add about 4 pumps of the Nexxus Humectress Hydrating Conditioner that I also bought at Costco. Leave the two conditioners on your hair for 5 minutes or longer before rinsing thoroughly. Step 2 – Over the years I have found the key to a good curly hair day and a bad curly hair day is all about your time management once you are out of the shower. I immediately wrap my hair in a towel, turban style, as soon as I get out of the shower. I then quickly apply lotion and moisturizer, throw on my robe, and start doing my hair! 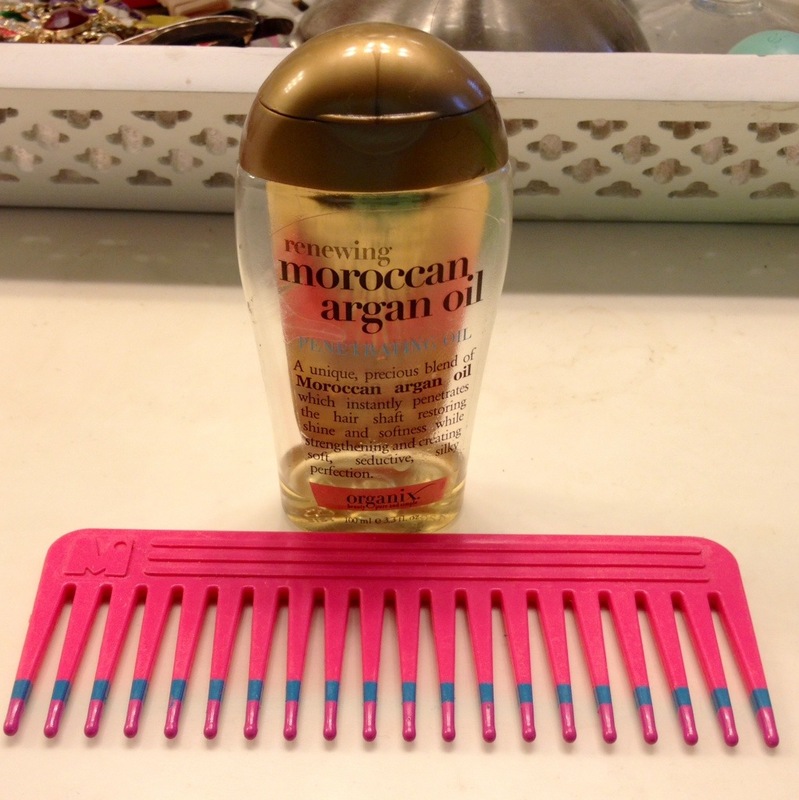 I love Moroccan Oil, I used to use the salon brand, but it is so expensive, so I switched to Organix Renewing Argon Moroccan OIl and I love it. I pour a quarter sized amount of oil into my palm and rub my hands together. I finger comb it through my hair, concentrating on the bottom half of my hair and avoiding my roots and scalp. I then use a wide toothed comb to completely comb out my hair. This is the only time I will comb/brush my hair until I wash it again. Step 3 – Once I have combed out my hair, I apply a small amount of Garnier Fructis Sleek & Shine Leave in Conditioner to my hair, followed by 7-8 pumps of Garnier Fructis Curl Calm Down, then a quarter sized amount of Garnier Fructis Curl Scultping Cream Gel. 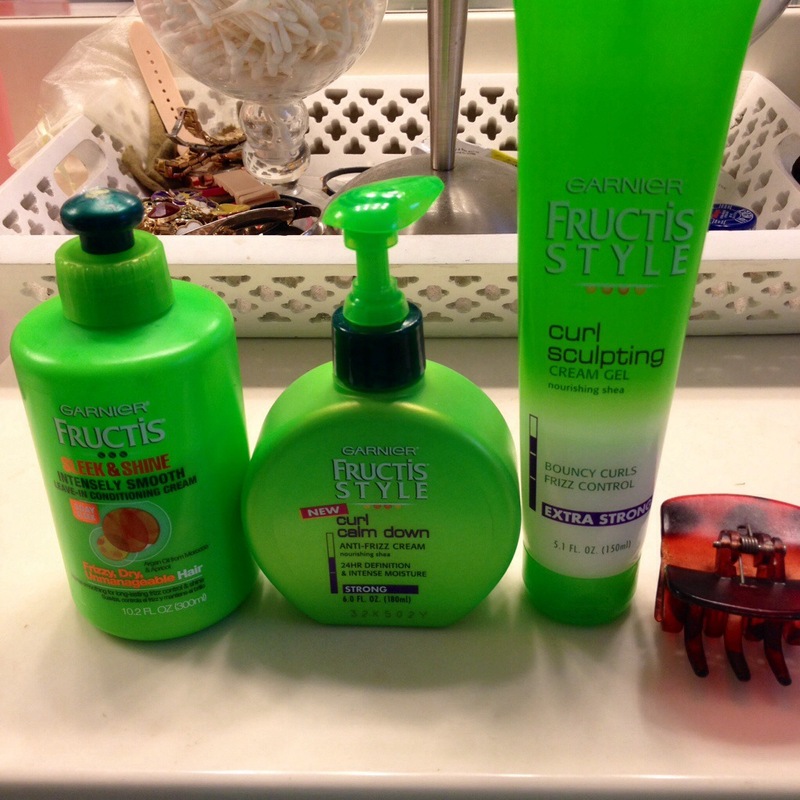 I just realized all of the products are Garnier Fructis! LOL! I find coupons in my Sunday paper almost weekly for Garnier Fructis products and buy them at Target with my Red Card for the extra 5% off. I have found these three products work great for me. I have extremely thick hair and this may be too much product for someone with thinner hair. If you have curls but fine hair, you may want to experiment and try either the Curl Calm Down or Curl Sculpting Cream Gel, but not both. Next I twist my hair at the nape of my neck and onto the top of my head in a huge French twist. I secure it with a claw clip. Leave your hair in the clip for as long as you can, I’ve left it in for nearly an hour. Go about your morning routine. Step 4 – I wait to diffuse my hair until I have finished my breakfast, makeup, and getting my son ready. I take my hair out of the claw clip and thoroughly spray my hair with Tresemme Climate Control Finishing Spray. I then diffuse my hair until it is about half way dry. I then spray all of my hair again with the finishing spray and finish diffusing until almost dry. I hope this post helps some of you curly haired readers! I’m so sending this to my sister who is on the constant mission to tame her curls! My wavy/curly hair is short (growing out to chin length bob). I can’t do the bun at night to keep curls fresh, find a lot of products too heavy for caucasion waves. Any suggestions for a routine? I’m going to try this. I have thick curly hair. My hair is always a pyramid shape. I just want something fun and it frizzy.